Dr. J. Cobb Scott completed a B.A. in Psychology at Wesleyan University, a Ph.D. in Clinical Psychology with specialization in Neuropsychology at the San Diego State University/ University of California, San Diego Doctoral Program, and clinical internship at the VA Connecticut Healthcare System. 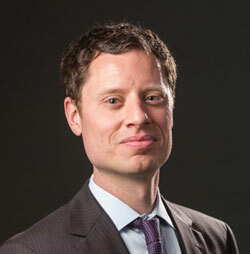 Dr. Scott joined the faculty of the Department of Psychiatry in 2013. Broadly, his research interests include the cognitive neuroscience and neuropsychology of psychiatric disorders and substance use. More specifically, Dr. Scott is interested in characterizing dysfunctional neurocircuitry in PTSD; understanding the brain-behavior overlap between PTSD and substance abuse; understanding relationships between cannabis use, cognitive functioning, and mental health, and examining the relationship between neuropsychological and everyday functioning outcomes, such as treatment response, in psychiatric disorders.